Post 8 of a series detailing our trip around South America. View the series so far here. Uyuni is a small, quiet city in Bolivia which most people visit for one reason only: to see Salar de Uyuni, the largest salt flat in the world. Whether you’re seeing it on a day trip or a multi-day tour, odds are you’ll begin and/or end here. We were no different, except unlike many tourists we didn’t leave on a tour within hours of arriving. 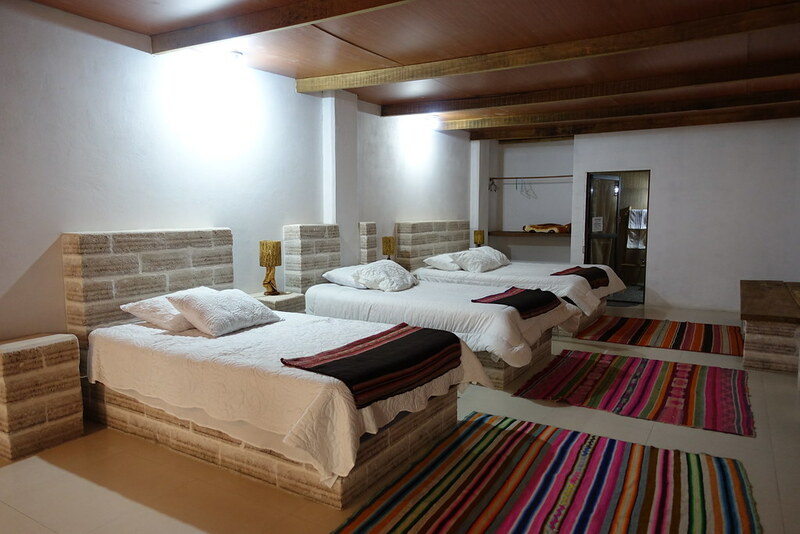 Instead, we decided to stay a night in Uyuni to see the city, take our time picking a tour, and experience a salt hotel. We arrived in Uyuni on the Trans Omar sleeper bus from La Paz not at 6am as we’d expected, but at 5am. Immediately after disembarking we were surrounded by people trying to sell us salt flat tours and hostels. We escaped the throng only to find the streets beyond eerily silent and empty, with no open businesses in sight. We had no map with which to find our hotel, and no idea what to do. In our desperation, we decided to trust a man who approached to invite us to his cafe. We followed him through an unmarked door, down a long, silent corridor. At the end of it was an empty and very basic cafeteria that we worked out was called Dy-Mar Restaurant. The man handed us menus, then disappeared again to find more customers. Although we felt a little dubious about the whole thing, we ordered egg on toast and pancakes from the quiet woman who came to take our order. It was basic but edible. The most valuable thing was the Wi-Fi, which enabled me to download a map of Uyuni. Eventually another couple arrived who looked just as dubious as we had done! We stayed at Dy-Mar until around 7am, when we thought it would be ok to check into the hotel. Back when I was researching this holiday, as soon as I discovered that hotels built from salt existed I knew I had to stay in one. 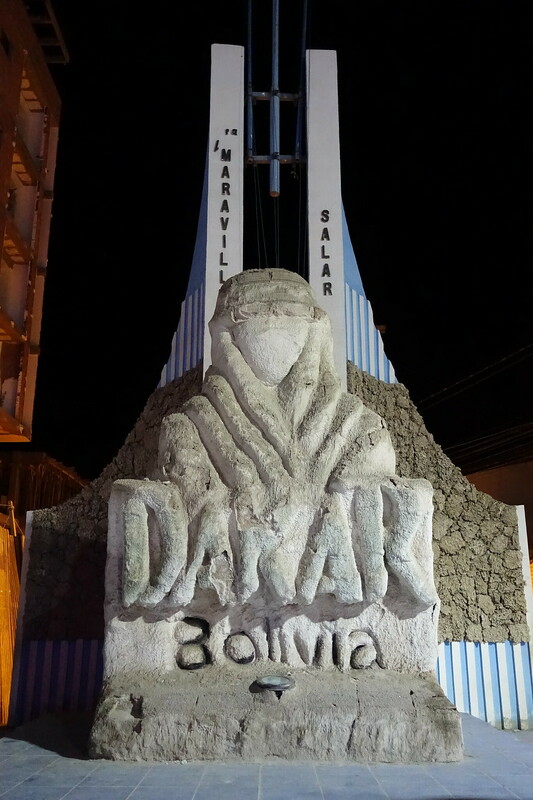 The problem was that all the salt hotels I was reading about, such as Palacio de Sal and Hotel de Luna Salada, were not only expensive but also located on the salt flat, making them difficult to get to and get back from. 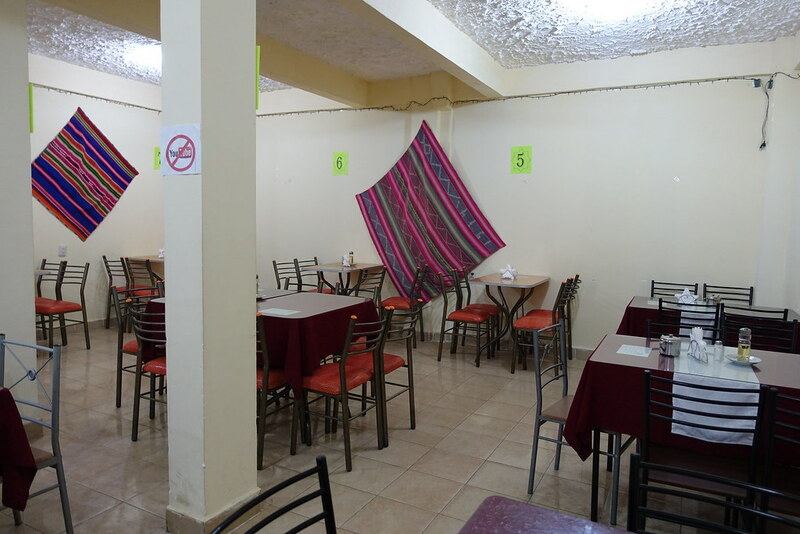 I didn’t want to be stuck using the expensive restaurants and tours offered by the hotels, when in Uyuni there are so many cheaper options to pick from. 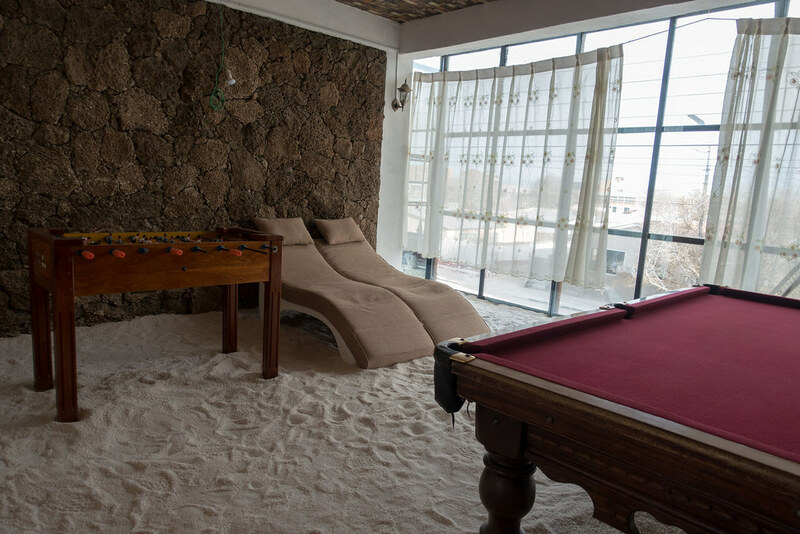 Fortunately, after a little more research I found a solution: a lesser-known ‘budget’ salt hotel located in central Uyuni called Casa Andina. 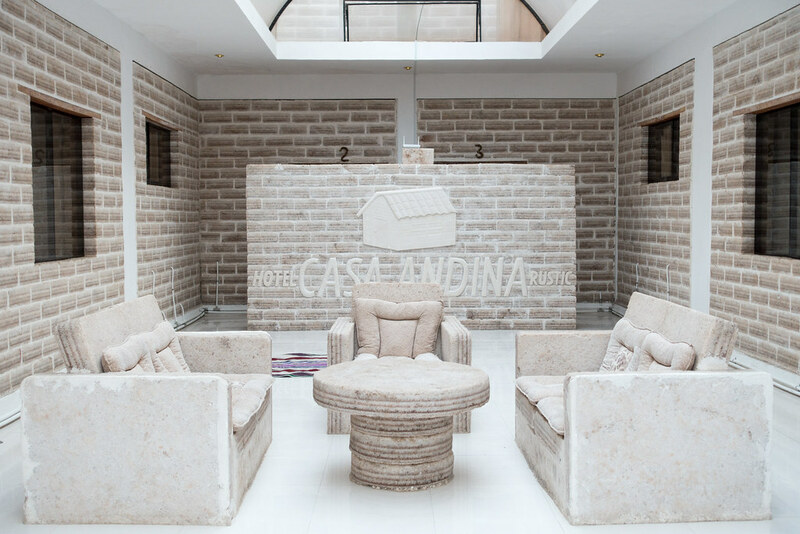 Stepping into Casa Andina, we were thrilled to see the large, bright, and very cool foyer. 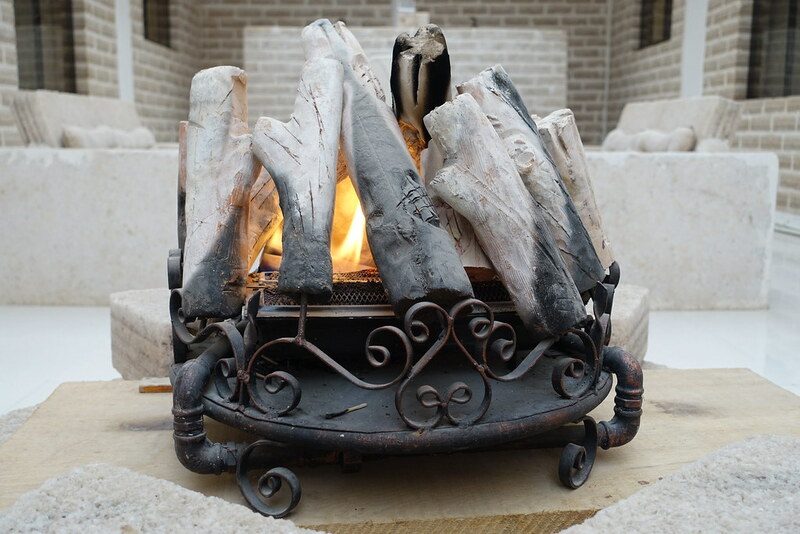 Everything in it, even the armchairs, was made of salt and in the middle burned an awesome-looking log fire. 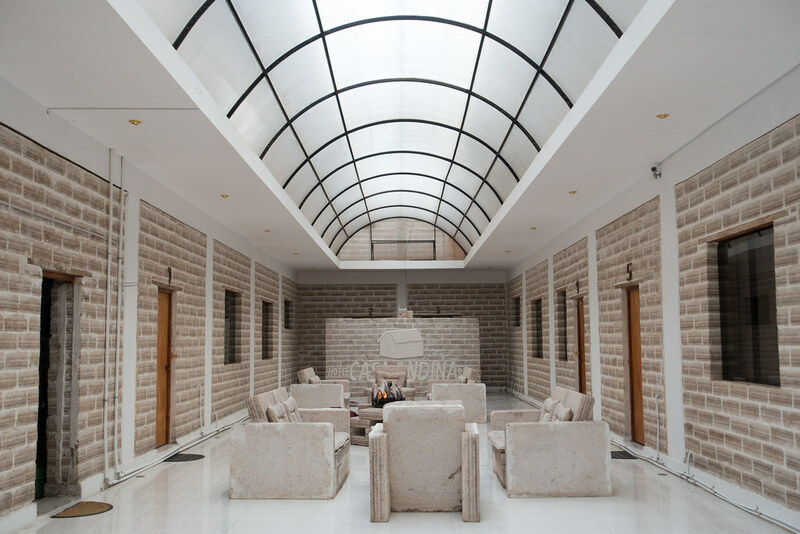 We were further pleased when we set eyes on our huge room, which had one wall featuring a picture carved from salt and another made from solid black lava rock. 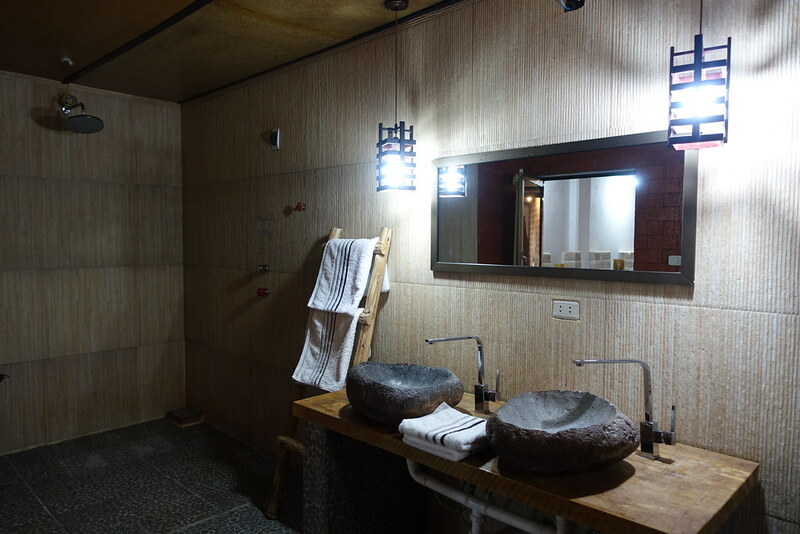 I loved the furniture built from salt bricks, the lamps crafted from cactus wood, and the en suite bathroom featuring sinks carved from rocks. We rested and refreshed ourselves in our room before heading out to find a salt flats tour. I’d already made a shortlist of tour companies that had sounded good on Tripadvisor, and we decided to visit each of their offices in turn to compare their offerings. Annoyingly two of them (Got Salt Bolivia and Jukil de los Andes) were shut, so after speaking to the remaining two companies we had two choices: a more comfortable, likely to be private tour for around $500 each with Uyuni Expeditions, or a less comfortable shared tour for around $150 each with Andes Salt Expeditions. After some further thought we decided to go for the cheaper tour, partly to save money and partly because we thought it would be more fun to go as a group. 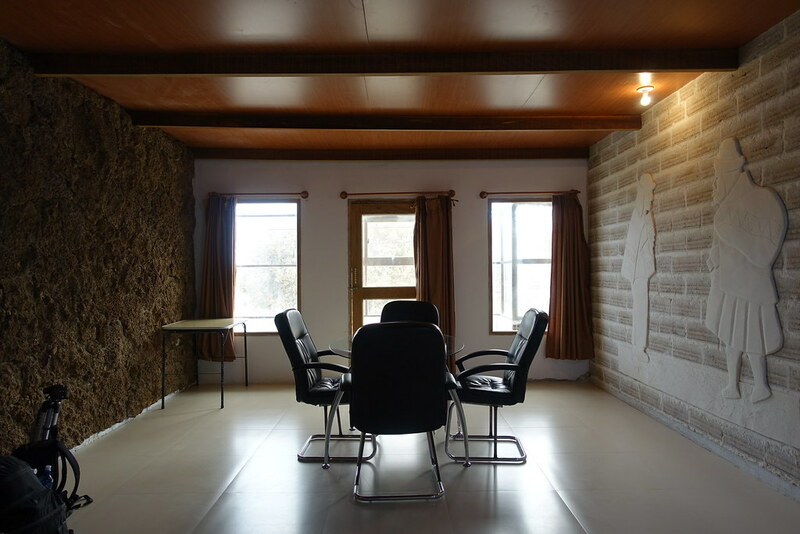 We returned to the Andes Salt Expeditions office and paid the full amount in cash. Following the advice of the woman at the Andes Salt Expeditions office, we next went to buy the essentials we’d need: toilet paper and lots of water. We stopped for lunch at the steampunk-themed pub Lithium Cafe, which was wasn’t great but passable. I had the soy sauce fried chicken, which itself was tasty but came with a weird side dish of cold cooked vegetables, plain rice and rock-hard potatoes. Steve’s pizza was better, but I wasn’t wholly convinced by the minced llama on it. Next I browsed the markets in pursuit of more warm clothes. I bargained as much as I could bear with the stall holders, which I found awkward but also kind of fun in how we sometimes resorted to sign language to communicate! I eventually bought a fuzzy alpaca-wool jumper and a lightweight coat. 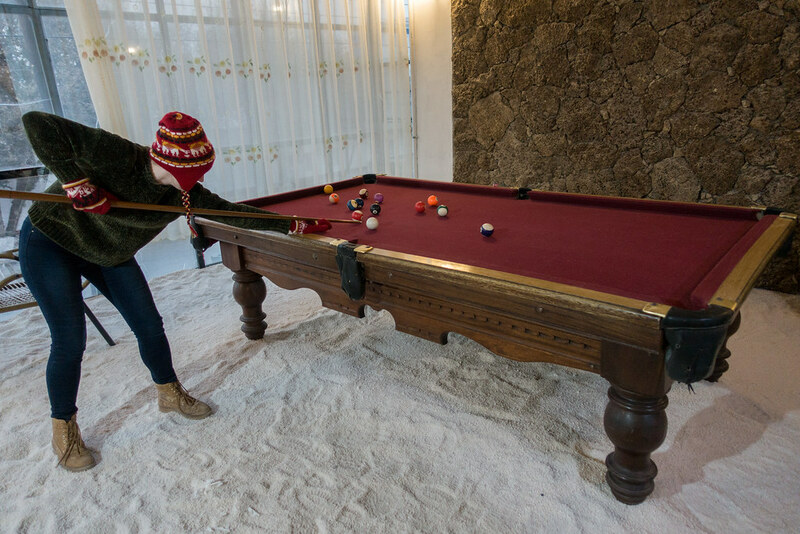 We returned to Casa Andina and played table football and pool in the salt-floored games room before heading out again for dinner. We went to a small restaurant called Iliphi for dinner, finding it quiet (we were the only ones there) but pleasantly cosy and colourful. The owner got my order wrong, but the quinoa with cheese and vegetables that he served me instead wasn’t bad. Steve had the layered meat tacos, which were disappointingly small. I tried one of the house cocktails made with local herbs but found it very bitter. Halfway through our meal the owner’s dog bounded in and practically came to sit at our table, enjoying having Steve stroke him (meanwhile, I was still trying to eat!). 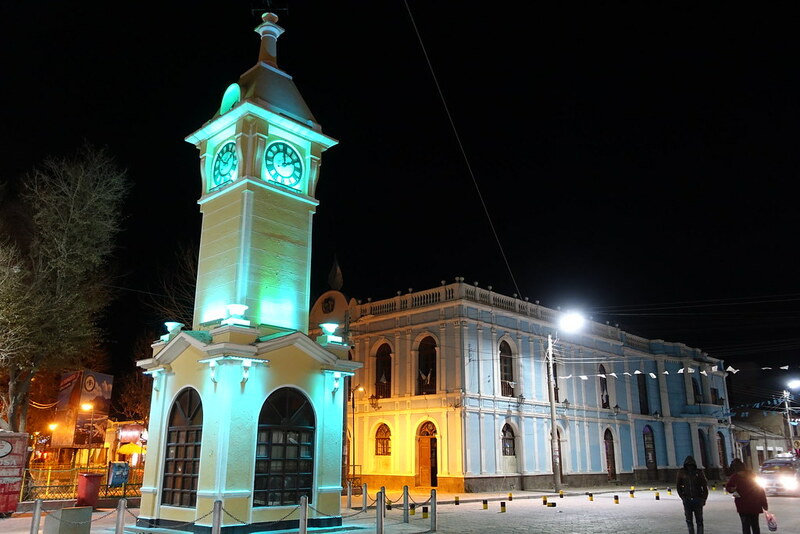 Walking back to Casa Andina afterwards, I enjoyed seeing the buildings of Uyuni lit up in the dark. We drank tea and read our books by the fire before turning in for the night. Tomorrow, we’d start our highly anticipated three-day tour of the salt flat and beyond. 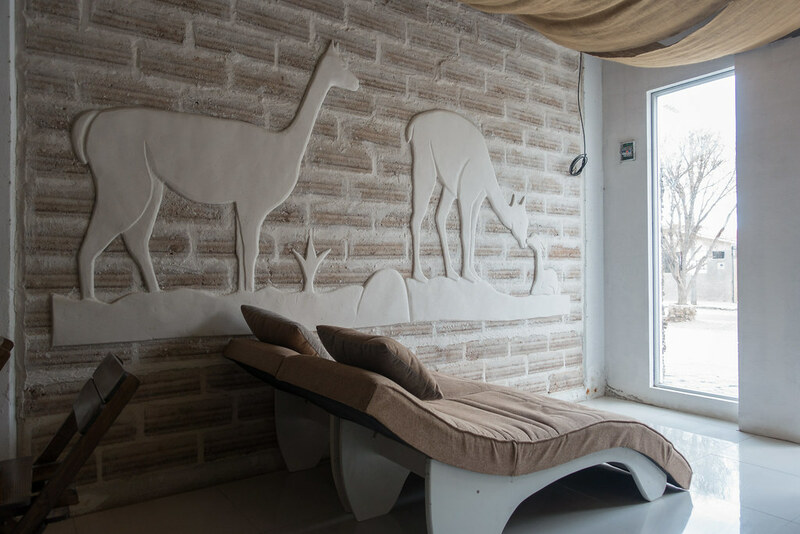 Posted in Bolivia, Reviews, South America, TravelTagged Casa Andina, Iliphi, Lithium Cafe, salt hotel, UyuniBookmark the permalink.